Effect: The Virgin Mary sheds real tears, and even the sweat on her body tastes saltish. In 1988 all over the world, icons and statues of the Virgin Mary started weeping. The tears tasted saltish and were believed to be real tears. This happened in Kerala also. Props: Hollow statue of the Virgin Mary made of plaster of Paris or clay with two holes in the eyes, filled with salt and water and sealed at the bottom. Method: The salt filled in the hollow of the statue melts with moisture and tears drip from the two holes in the eyes. Sweat forms on the body because of pores on the plaster of Paris or clay. Effect: Idols of Hindu gods and goddesses weep. In earlier days Hindu gods and goddesses also wept. It was considered to be an ill-omen indicating the ruler had committed some mistake and the god was upset. Earlier in this century, goddess Chamundeshwari at Mysore started weeping when the Mysore Maharaja appointed Sir Mirza Ismail, a muslim as dewan of Mysore State. Priests and Hindu fundamentalists did not like a Muslim being appointed Dewan of a Hindu State. Chamundeshwari was the family deity of the Mysore royal family. The priests rushed to the maharaja to tell him that the goddess is upset by the appointment and she was weeping. The dewan sent an intelligence officer to investigate the story and the trick was exposed. Props: Idol of god or goddess with crown and hollow up to the neck and with an inlet at the crown and two holes in the eyes. Water and Wax. Method: Crown of the idol is filled with water and the holes in the eyes sealed with wax. When the wax from the eyes is removed, water drips through the two holes in the eyes. During 2009-2010 reports appeared in a section of media that a flex print of Mary with Infant Jesus at Kattachira, Kerala had started miraculously shedding tears. This received wide publicity and the devotees started flocking to the church. This ‘miracle’ was debunked by Prof Narendra Nayak, who, along with the activists of Kerala Yukthivadi Sangham, visited the St.Mary’s Jacobite Chapel, Kattachira and investigated the case. 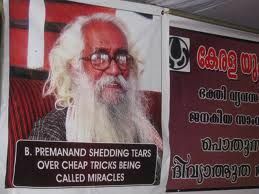 As a fitting response, Prof Nayak made a flex print of none other than B. Premand shed tears “over cheap tricks being called miracles.